Did you know 15% of America lives in poverty and that income for households after adjusting for inflation has declined by 8.3% since 2007? That America is making 9% less in real dollars than in 1999? 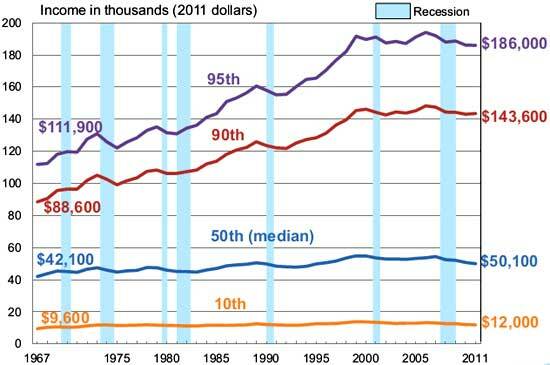 The latest annual Census report for 2012 shows America is still broken and poor. The Obama administration, with much fanfare, announced a WTO complaint filed against China on auto parts. The Obama Administration is committed to protecting the rights of nearly 800,000 American workers in our $350 billion auto and auto parts manufacturing sector. Export subsidies are prohibited under WTO rules because they are unfair and severely distort international trade. China expressly agreed to eliminate all export subsidies when it joined the WTO in 2001. China benefits from international trade rules and must in turn live up to its international obligations. While this action is long overdue, the realty is this administration has been complicit with China, refusing to label them a currency manipulator. Additionally the Obama administration has passed even more bad trade deals and is working on a mega bad trade agreement, the TPP. While Chinese auto part imports have surged 25% in the last two years, so has the overall manufacturing trade deficit. 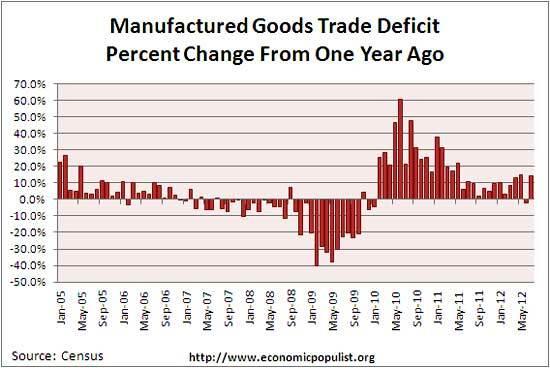 Below is the percent change from a year ago in the manufactured goods trade deficit. This trade deficit has increased 14% from one year ago and 26.3% from two years ago. Ah, we all know the claim offshore outsourcing is good for America. Seems offshore outsourcing is great for drug dealers and money launders too. Did you know offshore outsourcing enabled money laundering, flash crashes and failed projects? The latest banking scandal of Standard Chartered laundering Iranian money is all over the news. But did you know Standard Chartered Bank offshore outsourced to India their entire compliance operations? The DFS probe found that SCB had assured the New York state in May 2010 that it would take immediate steps to comply with the US Office of Foreign Assets Control (OFAC) sanctions. However, another regulatory examination in 2011 found continuing and significant Anti Money Laundering failures. Among these, the bank was outsourcing its "entire OFAC compliance process for the New York branch to Chennai, India, with no evidence of any oversight or communication between the Chennai and the New York offices." There is another war going on in America. You may not have heard about it, but Congress has declared war on facts. The House of Representatives voted to kill the Economic Census and eliminate the American Community Survey.